It was about more than pomp, circumstance or political agendas. If we have ears to hear, the President’s speech echoed eternal truths — and a call to action. As I watched the annual State of the Union address, I was energized and filled with hope. We know that God is at work and our prayers — coupled with righteous action as salt and light — can make an enormous difference. It reminds me that the Most High rules in the kingdoms of men. He gives it to whomever He will and sets over it the lowest of men, to paraphrase Daniel 4:17. God is moving, and the potential for great renewal is available. However, we must answer the question posed by the President in his address. “What will we do with this moment? How will we be remembered?” My appeal is in solidarity and unity with the appeal of the President. Let us “choose greatness,” as he said. We serve a Great God, let us be a great people. As Americans, yes; in our policies, yes; with civility, yes. In our care for others and our integrity among the nations of the world, yes. But most of all, as people of God with Kingdom focus, let us choose greatness. I see three immediate steps, reflected in President Trump’s powerful speech. Choosing greatness means that we choose to defend the defenseless. Jesus’ words and life exemplified the defense and inclusion of the “least of these.” His gospel was to the margins, and its scope was expansive in the most unlikely of ways. We too must be passionate in defending the defenseless and standing up for those who cannot stand up for themselves. These are living, feeling, beautiful babies who will never get the chance to share their love and dreams with the world. And then, we had the case of the Governor of Virginia where he basically stated he would execute a baby after birth. This is historic for our nation and we must champion it to choose greatness. Let your voice be heard! Contact your local and national leaders. Let them know you expect “legislation to prohibit the late-term abortion of children who can feel pain in the mother’s womb. Redemption is the heart of the gospel. Through it, God offers us His new mercies every morning. As followers of Jesus, we must fight for the redemption of others — seeking to save, rescue, restore, and offer another chance. I’m thrilled to see that powerful truth of Scripture echoed in the State of the Union address and backed up by legislation like the First Step Act. It was the most significant criminal justice legislation in years, passed thanks to remarkable bipartisan support. We must continue to actively work to reform our prison system and “the disparities and unfairness that can exist in criminal sentencing.” As President Trump said, “America is a nation that believes in redemption.” Let us fight for second chances and look for ways to extend grace to those who experience transformation. Greatness begins with service. A primary theme of the President’s State of the Union address was the significance of service. The many heroes highlighted showcased the American ideal of service and sacrifice. 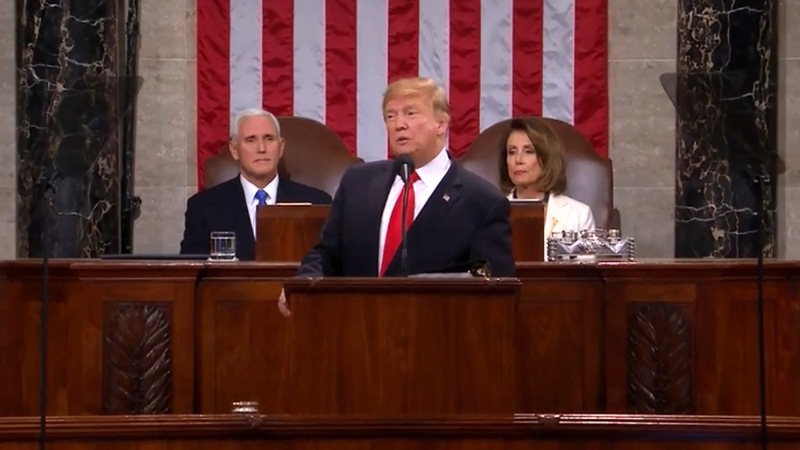 In his address, President Trump challenged the American people. As Kingdom citizens, we must rise up to serve. Choosing greatness means that we will volunteer to be the answer to the questions of our day. We will embrace the call to serve where we are with what we have, and thereby live out the gospel of Jesus in our world. Heroes are heroes because they rescue, save, defend, protect, and sacrifice to save. Now, it’s our time, as residents of the great nation and citizens of Heaven. We join God’s work in bringing renewal and reconciliation to our land. “What will we do with this moment? How will we handle these opportunities?” These questions asked by our President have significant Kingdom implications. Let us go forward together, and rise to the occasion. Let us choose greatness! Mike Hayes recently authored the new book Renewal, which is now available. Explore The Stream’s complete State of the Union coverage, and sign up to receive top stories every week.